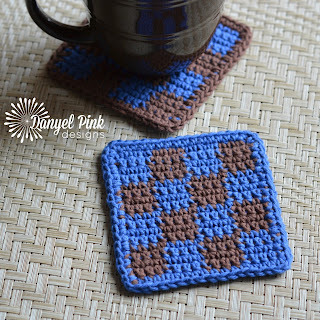 These little coasters are quick and fun to crochet, and are a great stashbuster project. I use mine on my desk for my coffee mugs and iced tea glasses. 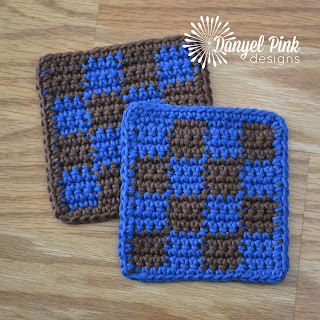 They also work very well as face cloths or mini washcloths for kids! Beginning ch-1 of each row does not count as a st.
Change colors by working last stitch of previous color to last 2 loops on hook, then yo and pull new color through. Work over unused color throughout, for stability and ease. 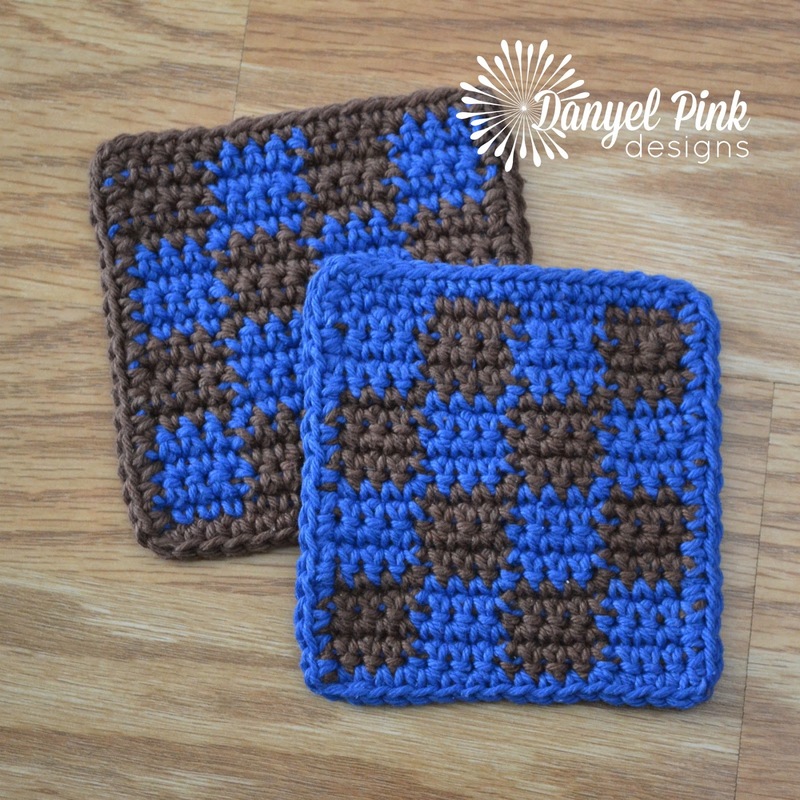 To make a larger coaster or placemat, work starting ch in multiples of 4 + 1, and work checkerboard pattern to desired length. Row 1: Working in back bumps of chs, sc in 2nd ch from hook and in next 3, with B sc in next 4, with A sc in next 4, with B sc in next 4—16 sc. Row 2: Ch 1, turn, [with B sc in next 4, with A sc in next 4] twice—16 sc. Row 3: Ch 1, turn, [with A sc in next 4, with B sc in next 4] twice—16 sc. Rows 4–5: Repeat Row 2. Rows 8–9: Repeat Row 3. Rows 12–13: Repeat Row 2. Row 15: Repeat Row 2. Round 1: With A or B, ch 1, turn, sc evenly across, *(sc, ch 1, sc) in corner st, sc evenly across side; repeat from * around, ch 1, sl st to 1st sc to join. ☞ © 2016/2017 Danyel Pink. 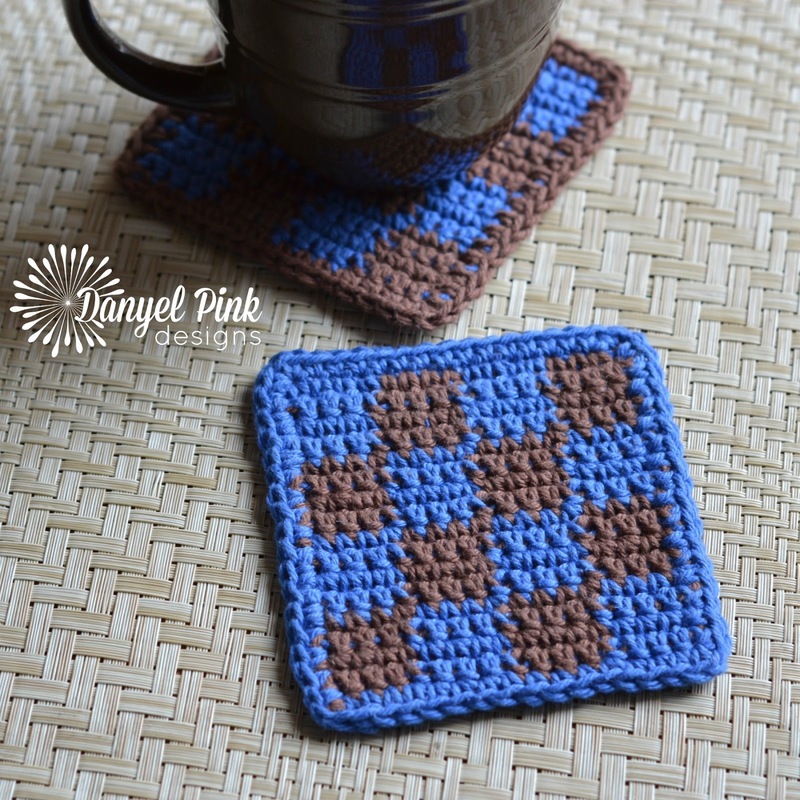 You may sell what you make, but please credit Danyel Pink Designs for the pattern. You may NOT resell the pattern, distribute it in any form, post it elsewhere online, or alter it to claim it as your own. 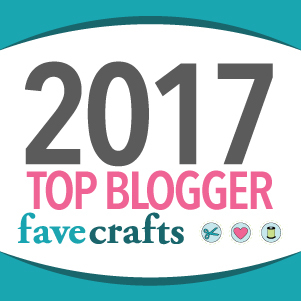 Please provide a link back to my blog instead. 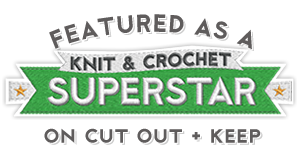 Contact me with any questions or for pattern support.